Banana Bread! After making many many loaves over the years, I’d have to say this is definitely the best! It’s easy, so tender, perfectly moist, it’s packed with banana flavor and it has a delicious richness from the sour cream and butter. It’s a a tried and true recipe you’ll use time and time again! Continue reading as I share step by step pictures and a video to learn how to make it. The All Time Best Homemade Banana Bread Recipe! Banana bread has been one of my favorite treats since I was a kid, so after 30 years I hope by now I could have perfected it :). 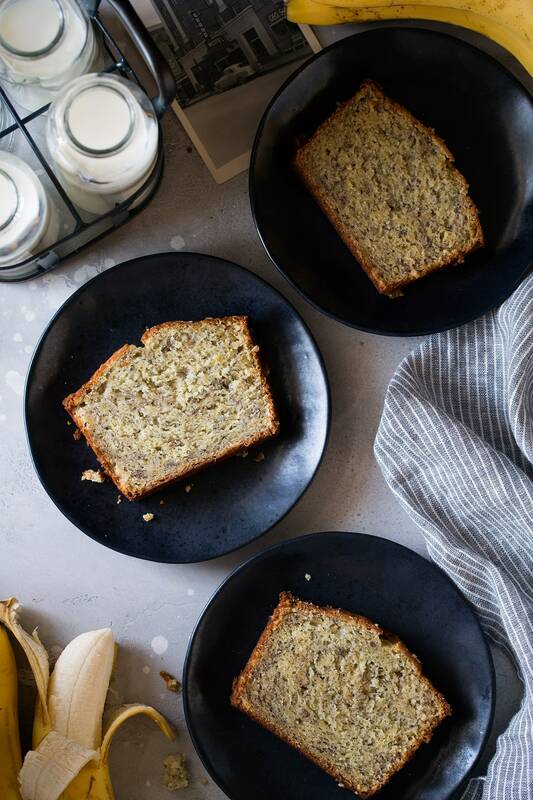 My easy banana bread recipe uses staple ingredients that I always keep on hand, so when those bananas turn from vibrantly yellow to golden and well speckled you’ll know exactly what to make with them. This really is one of the easiest baking recipes! You don’t even need a mixer. Just back to basics with a few bowls, a spatula and a whisk. The hardest part is just waiting for it to bake and cool. That smell of a loaf of fresh banana bread is heavenly. 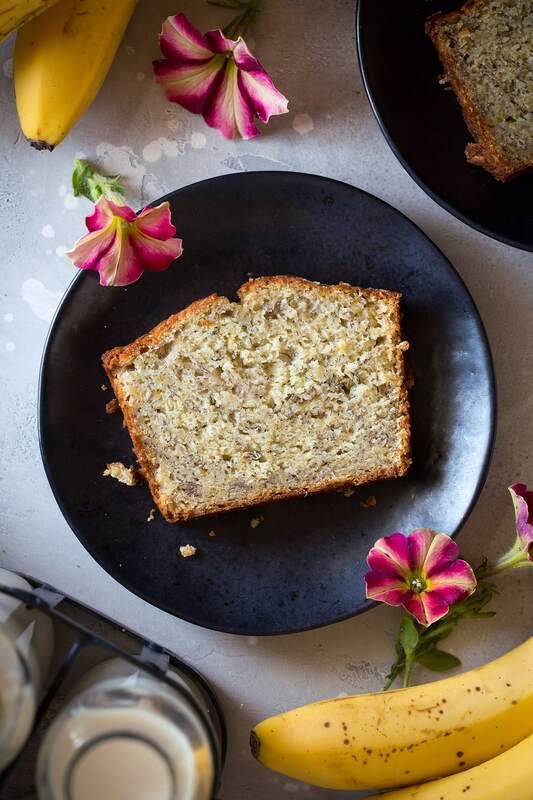 Every time I make this ultra moist banana bread we polish it off in no time. There’s just something so comforting about a loaf of homemade banana bread. I think it takes us all back home because we all ate it growing up. I hope you enjoy this recipe as much as we do! Flour – all-purpose flour works best. Baking powder and baking soda – these make the bread rise. Salt – keeps it from tasting flat. 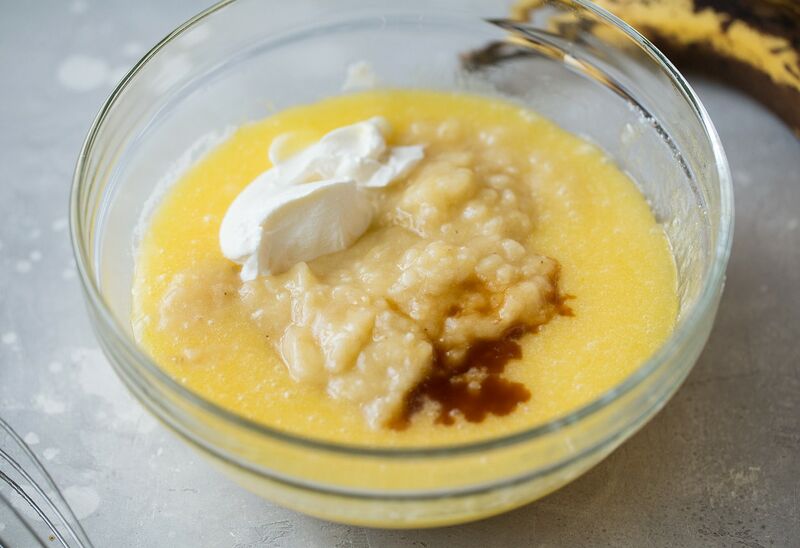 Butter – it’s melted in this recipe which means easy mixing! Granulated sugar – in a pinch brown sugar would work too. Eggs – the eggs bind everything together for a nice sturdy slice. Bananas – you’ll need about 3 large or 3 1/2 medium bananas. 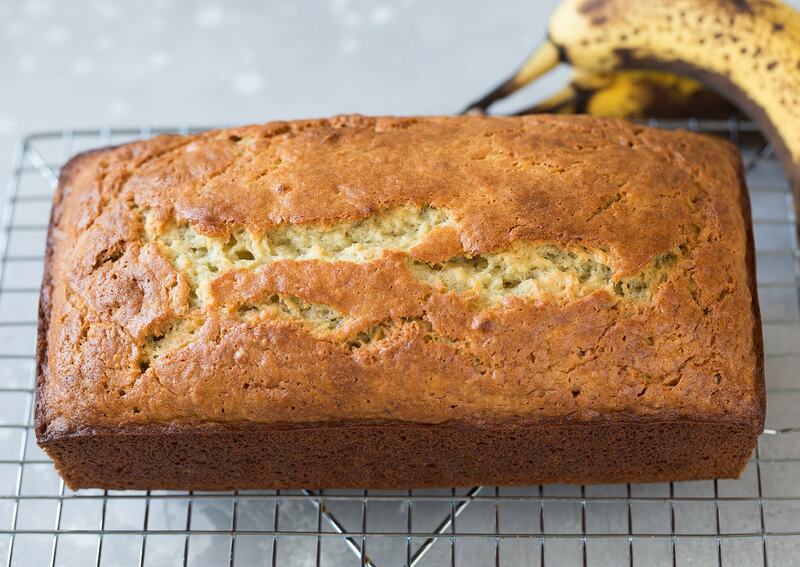 Don’t use underripe bananas that aren’t sweet enough or overripe with an off flavor. Sour cream – don’t have any of this on hand? I’ve also just used an extra 1/4 cup banana in it’s place. Vanilla – this isn’t crucial if you don’t have it but a nice background flavor if you do. Preheat oven to 350 degrees. Spray a 9 by 5-inch or 8 1/2 by 4 1/2-inch loaf pan with non-stick cooking spray (or rub with butter and lightly flour). 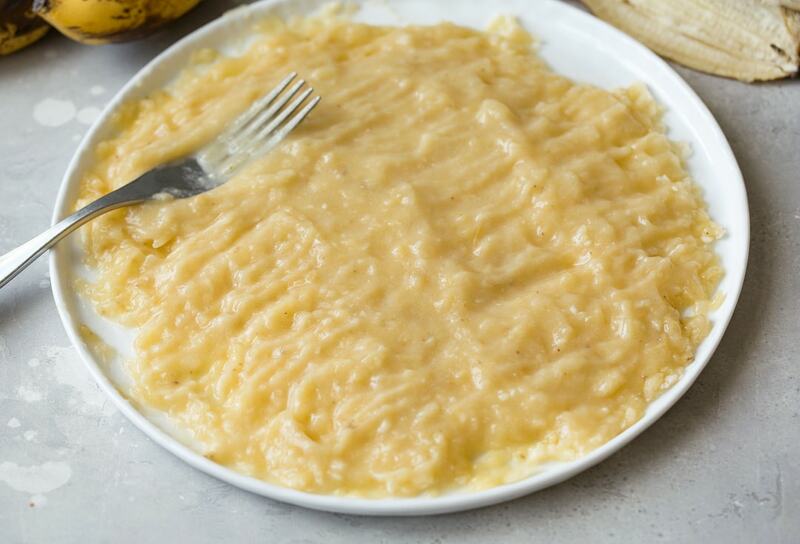 Mash bananas: Set the peeled bananas on a plate and mash all of them to a nearly smooth puree using a fork (another reason using overripe bananas is great, not only do they taste sweeter but they mash easier too). 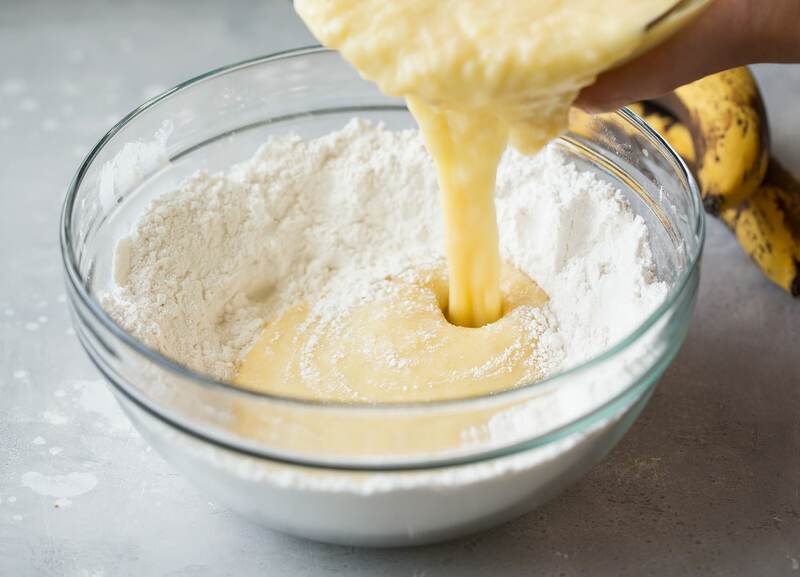 Mix dry ingredients: In a mixing bowl whisk together flour, baking powder, soda and salt. 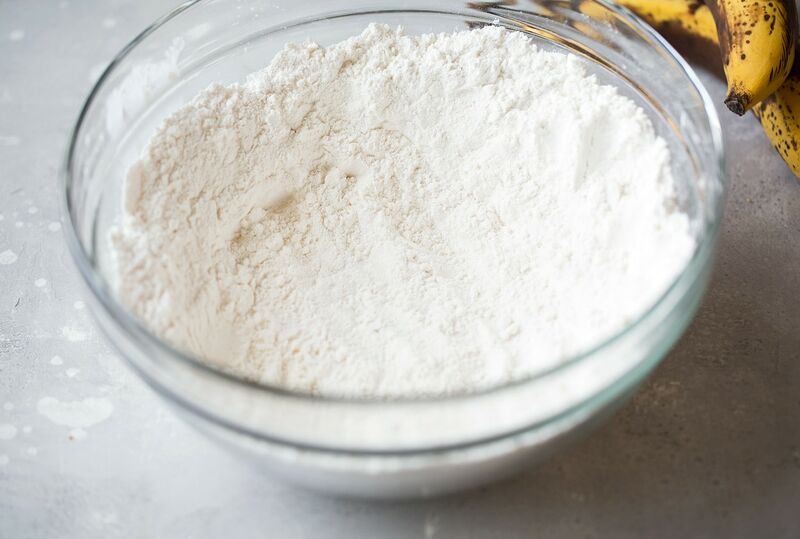 Make a well in center of flour mixture, set aside. 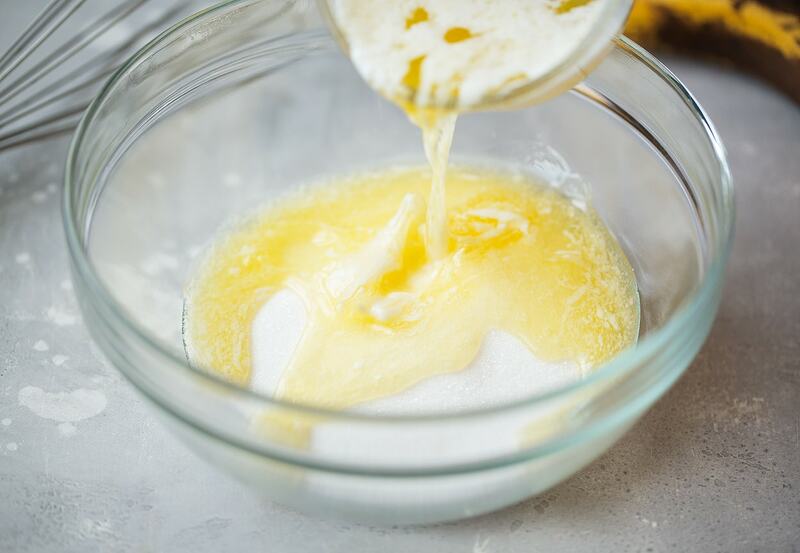 Mix sugar and wet ingredients: In a separate medium mixing bowl whisk together melted butter and granulated sugar. 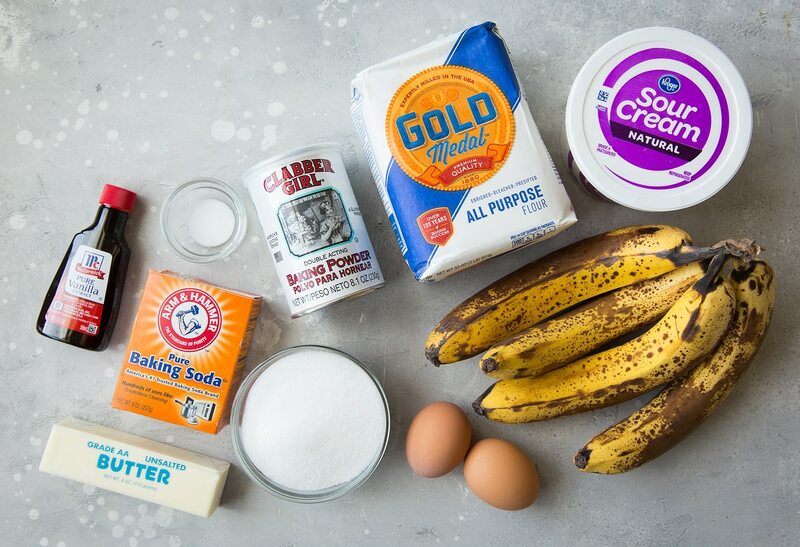 Mix in bananas, sour cream and vanilla extract. 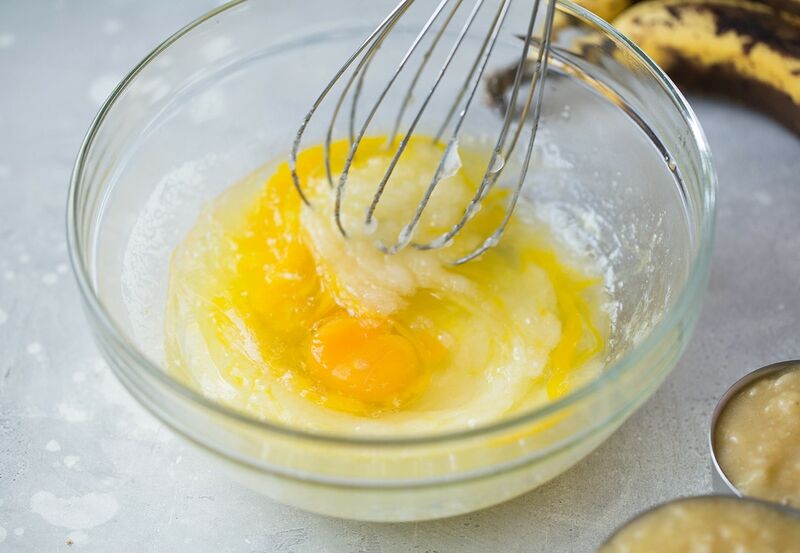 Combine wet and dry mixtures: Pour banana mixture into flour mixture and fold with a rubber spatula just until combined (you shouldn’t see any more streaks of flour, just be careful not to over-mix for a fluffier bread). Bake until just set: Bake in preheated oven until toothpick inserted into center comes out free of batter (a moist crumb or two is fine but top should be set), about 50 – 58 minutes. Cool before slicing: Cool in pan 5 minutes. Run knife around edges to loosen then invert onto a wire rack. Let cool on wire rack about 30 minutes then transfer to an airtight container to finish cooling. Can I Add Nuts or Chocolate Chip? 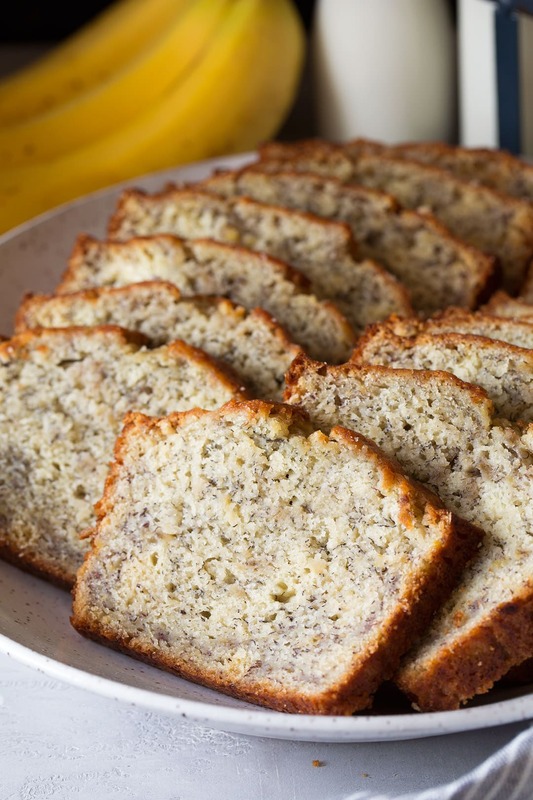 Want to make this recipe into banana nut bread? 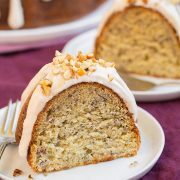 Simply add in 1/2 cup to 1 cup of chopped nuts (I recommend walnuts or pecans) and add them when you mix in the bananas. Then, be sure to use a 9 by 5-inch pan as the batter will have more volume. Do you love chocolate chips in your banana bread? Then just mix in 3/4 cup semi-sweet chocolate chips or 1/2 cup mini chocolate chips for a bit of added decadence. Can I Make Two Loaves Instead of One? Yes. I’ve doubled this recipe successfully. Just divide mixture evenly among two greased pans. Can I Make the Batter into Muffins? Yes. Divide among paper lined muffin cups filling each 3/4 full. Bake 350 approximately 20 minutes. How Should I Store Banana Bread? 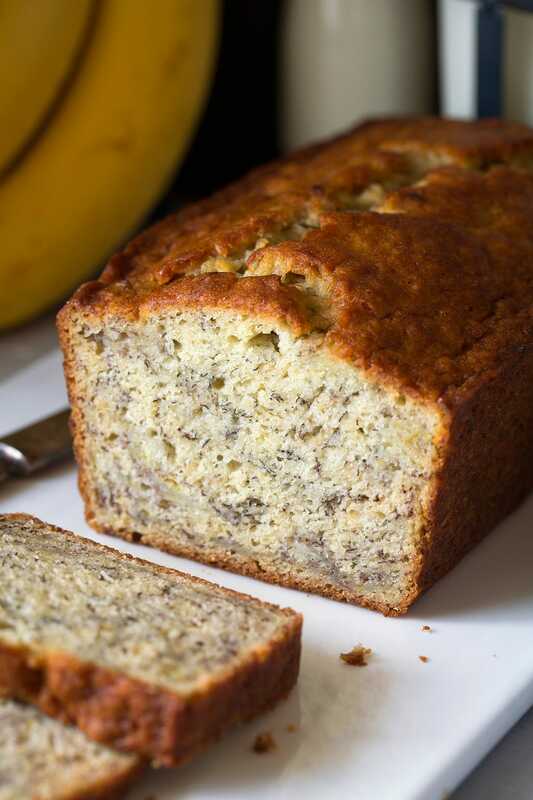 Banana bread can be kept on your counter for a few days in an airtight container, or refrigerate for 1 week. Yes. Wrap the loaf in foil and place in an airtight container and freeze it for up to 2 months. When you’re ready to eat the frozen banana bread, simply set it in on the counter to thaw. Add a cinnamon sugar topping. To do so sprinkle top evenly with a mixture of 1 1/2 Tbsp raw sugar and 1/2 tsp ground cinnamon. It gives it that special bakery-style touch. Swirl the top with Nutella or a sweetened cream cheese filling. Mix in 1/2 cup shredded coconut and 1/2 cup diced pineapple for a tropical twist. Add some peanut butter chips. Who doesn’t love that peanut butter banana combo? Try it with fresh blueberries or diced strawberries. Smoothie flavors in dessert form. Or serve it warm ala mode with a scoop of vanilla ice cream on top and drizzled with caramel sauce. Yum! Be sure to use very well ripened spotted bananas they offer the best flavor and sweetness. Avoid black bananas though because they’re usually starting to rot and they don’t have a good flavor. Don’t pack flour when measuring. Better yet use a kitchen scale if you have one. Only use real butter. No shortening, no margarine, no oil. Check dates on baking soda and baking powder. If they’re outdated the loaf may not rise the same. Adjust salt if needed. Only have salted butter on hand? Reduce salt to 1/4 tsp so it’s not overly salty. Once you are folding in the flour be careful not to over-mix so you get a nice tall loaf. Just fold until there’s no longer streaks of flour. Careful not to over-bake for a supremely moist loaf. Serve it the next day if possible. Banana bread is even better one day after it’s made. This is the best banana bread recipe! Quick and easy to make and no mixer is required. It's perfectly moist and amazingly tender, it's buttery and brimming with banana flavor. Simply put, everyone will have a hard time stopping at just one slice! Pour banana mixture into flour mixture and fold with a rubber spatula just until combined (you shouldn't see any more streaks of flour). 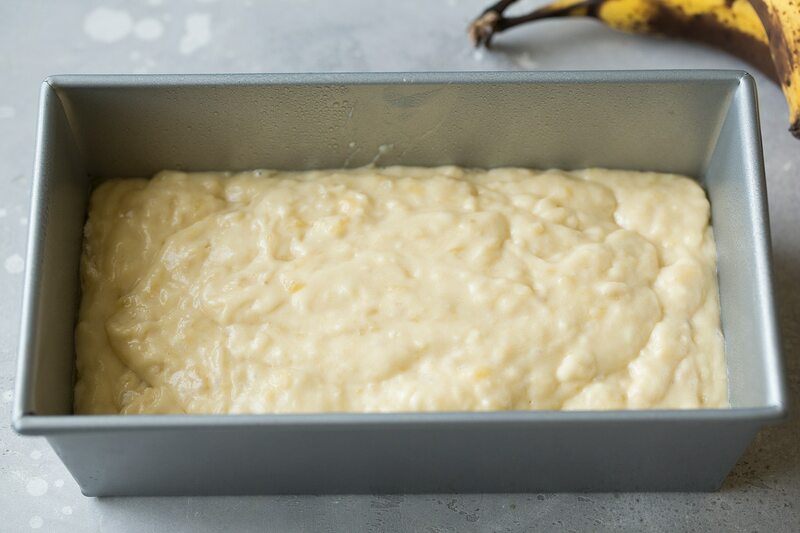 Pour batter into prepared loaf pan. Bake in preheated oven until toothpick inserted into center comes out free of batter (a moist crumb or two is fine but top should be set), about 50 - 58 minutes. *You can adjust the sweetness to suite your taste. I prefer 3/4 cup sugar but if you like it really sweet use 1 cup, if you like it lightly sweetened use 1/2 cup. Be sure to use very well ripened spotted bananas though, because they offer the best flavor and sweetness. In a pinch, if you don't have sour cream just add 1/4 cup more mashed banana. If you only have salted butter on hand, reduce salt in recipe to 1/4 tsp.